Fifteen ghost stories from historical fantasist McOmber (The White Forest, 2012, etc.). 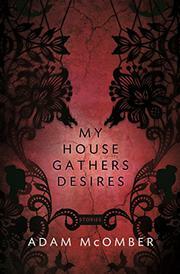 Gothic overtones and sexual undertones color this new collection of eerie, nearly antique tales. The opener, “Hydrophobia,” starts ordinarily enough, opening on Jane, a doctor’s wife, taking a walk in the woods. But when she meets a boy painting there, he tells her a story about a miner and his wife who came to a bad end, leading to a grotesque fate for Jane as well. In “Petit Trianon,” two young women set out to explore the final refuge of Marie Antoinette, a place whose ghosts do not yet rest. The judgment handed down in “Sodom and Gomorrah” differs radically from the biblical interpretation: “We finally understand the meaning of our monument’s song, the words it has been chanting even when we could not hear: there are no gods, it says in its beautiful voice. And if there are, my friends, believe me: they do not matter.” A phantasmagorical fair provides the background for “Poet and Underworld,” while a traveling museum with a dark purpose sets the stage in “Metempsychosis.” The collection’s title comes from the Civil War story “Swaingrove,” which finds an aging raconteur admiring the handsome young soldiers who come to call. A woman becomes a human sacrifice in “The Rite of Spring,” while a different girl suffers for the sins of another in “Night is Nearly Done." Finally, McOmber explores obsession with the body in “History of a Saint,” about one man’s explorations of a “sleeping girl” discovered during an excavation, and finishes with “Notes on Inversion,” one doctor’s catalog of sexual deviance. These aren’t for everyone, but readers who feel more kinship with Edgar Allan Poe or Lord Byron than the modern world will find common ground here. An otherworldly collection of tales rich with mystery, suspense, and eroticism.